Dianne White lives in Gilbert, Arizona, with her family. She is the author of Who Eats Orange? 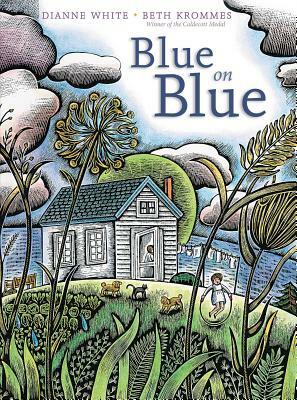 and the award-winning picture book Blue on Blue. Beth Krommes received the Caldecott Medal for The House in the Night by Susan Marie Swanson. She lives with her family in Peterborough, New Hampshire. Readers can be forgiven if they think that this lovely picture book and the 2009 Caldecott Medal winner, The House in the Night, by Susan Marie Swanson, share the same author. Of course that’s because illustrator Krommes’ artwork is so intricately powerful that it tends to dominate each title. And as fine as the art is (and it’s very fine), that’s too bad, because both texts are outstanding. Here the story is about sun and rain and the effect it has on one family’s day. The story opens with a mother hanging laundry on a line while the children play: “Cotton clouds. Morning light. / Blue on blue. White on white.” But as the farm animals look on, the sky darkens, and soon the rain is falling. The storm makes the daughter hide under her covers, pigs look on warily as streams of water rush through their pens, and the baby’s cries meld with the torrent. Then everything slows—enough so that the girl can go outside with her umbrella; enough so rain rivers turn to mud. And then, finally, there’s sun once more. The lines of text are evocative and brief, giving children the opportunity to savor the words. The scratchboard-and-watercolor pictures expand the text with its country vistas and bring the intensity of storms close to home in the family scenes, offering more to see on each reading. A joyous, pelting, dripping celebration. * "Centered on a whitewashed New England farmhouse and the fields and ocean that surround it, Krommes’s nostalgic scratchboard and watercolor spreads bring newcomer White’s clipped verse to life. . . . White’s graceful pacing spreads the energy of the storm across the arc of the story, while Krommes’s primitive folk art gives a sense of the rhythms of life and nature that recur from season to season, year to year." * Readers can be forgiven if they think that this lovely picture book and the 2009 Caldecott Medal winner, The House in the Night, by Susan Marie Swanson, share the same author. Of course that’s because illustrator Krommes’ artwork is so intricately powerful that it tends to dominate each title. And as fine as the art is (and it’s very fine), that’s too bad, because both texts are outstanding. . . . The lines of text are evocative and brief, giving children the opportunity to savor the words. The scratchboard-and-watercolor pictures expand the text with its country vistas and bring the intensity of storms close to home in the family scenes, offering more to see on each reading. A joyous, pelting, dripping celebration." * "A thunderstorm interrupts a young girl and her farm family's daily routine, until finally the drips stop dropping for some muddy fun before bedtime. Succinct rhymes, measured and musical, trace the arc of the day, from morning to moontime, with astonishing restraint, grace and fluidity. Words land on readers' ears with the pleasing, plodding patter of raindrops. Unexpected word choices endow simple poetry with remarkable inflections. . . . Double-page illustrations, enriched by copious crosshatches and confident linework, bring the farm's kitchen, pastures, barnyard and stable into almost three-dimensional focus. Rounded shapes soften each scene, instilling the pictures with bosomy warmth that surfaces everywhere. . . . A radiant sun, beaming with bars of light clear to the horizon, serves as a perfect visual for this idyllic song for the agricultural family—one that's weathered many storms. Folk-art-inspired illustrations, astonishing in both their technical accomplishment and their heart, harmonize beautifully with lyrical language." "A beautiful sunny day darkens as clouds gather and rain arrives. From morning till bedtime, the story follows a young family on their farm. Rhyming, spare text augments the striking scratchboard and watercolor illustrations. Round shapes and subtle warm colors create a sense of love and safety despite the storm. Rich illustrations invite close study. . . . The combination of limited, strong text; rich illustrations; and child-centric perspective make this a strong choice for storytimes and one-on-one sharing." “Cotton clouds. / Morning light. / Blue on blue. / White on white.” Blue sky and a blue lake promise a lovely day, and so it will be, even with upcoming changeable weather included: “Gray on gray. Dark and glooming. / Black on black. Storm is looming.” Succinct couplets trace wind and rain to their gentler aftermath until “Glitter stars, / twinkling light. / Black on gold… / on silver night.” Inviting illustrations set this meteorological report on a cozy farm. Dogs and children, alarmed by thunder, scoot inside; farm animals scurry for shelter. Post-storm revelers include blissful pigs in mud and a puddle-happy child. Krommes’s (The House in the Night) scratchboard technique—elegant yet assertive black outlines; sturdy rounded forms; strong compositions where straight lines (such as pelting rain) counterpoint the prevailing curves (from a puddle to the earth itself)—makes this a particularly handsome book, here glowing with a rainbow of added watercolor. Debut author Dianne White describes in rhyming couplets the drama of a rainstorm. Caldecott Medalist Beth Krommes (The House in the Night) invents a visual story line about how it transforms the routine on an idyllic farm. The book opens at daybreak: "Cotton clouds./ Morning light./ Blue on blue./ White on white." Krommes's scratchboard and watercolor illustrations create layers of possibilities: a white bird in a blue sky, a blue roof on a white clapboard house with blue curtains in the window, a white sail on a blue river. A girl and her baby sibling play outside as their mother hangs laundry. "Weather changes./ Air grows colder" accompanies a horse's eye–view from a hilltop: a farmer plows a field as his hat blows off, the pigs run for cover and, on the next page, the sailboat lists perilously. The girl and one of her two dogs hide under the covers in her room while, through the window, readers see the farmer lead the horses into the barn ("Thunder! Lightning!/ Raging, roaring"). Finally, "Winds shift./ Drops drip" and child and puppies venture out. One of the pups watches a turtle surface (children will love discovering two submerged turtles). "Muddy, muddy.../ everywhere!" ushers in a wallowing party for pigs and child. Discover: A first-time author and a Caldecott Medalist convey the transformative experience of a rainstorm. White clouds freckle the blue sky. Darkness and showers move in. Carried away by the wind, the storm passes and reveals the sunset. Night begins with the soft moonlight. The sky is at peace. In her expression of love for rainstorms, White effortlessly captures an ordinary day with a few, carefully-selected words. The wonder of a nature is illuminated by velvety alliteration and rhyme, leaving readers young and old longing to hear the simplicity of a cloudburst captured on paper once again. Readers will be in awe of the detail residing in Krommes’ rainbow of scratchboard and watercolor illustrations. Her stunning and meticulous visuals fully complement the text. Jump inside the pages, take a good look around, and visit the family, farm, and animals which dwell within. This book is a composition of lyrics and art best read aloud.